Casey Family Programs President and CEO William C. Bell joined local child welfare leaders and community members for a “Making It Happen” event in Raleigh, N.C., on May 23. 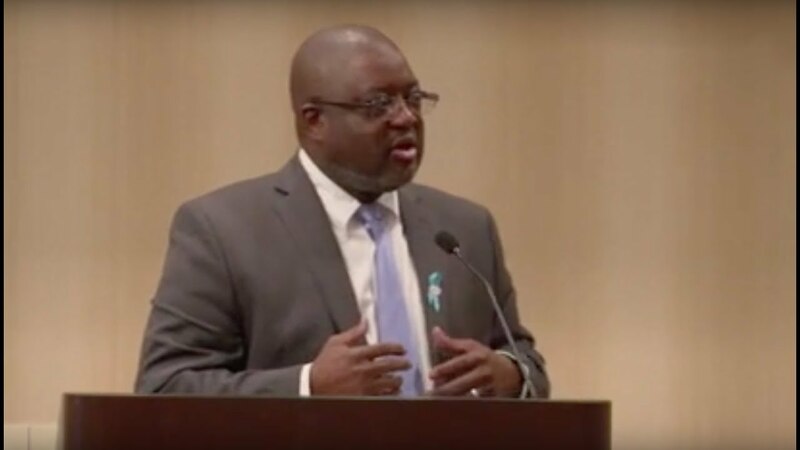 About 150 people attended the daylong conference, which featured speeches by Dr. Bell, Wake County officials, and representatives of Children’s Home Society of North Carolina, the faith community, and a former foster youth. Break-out sessions focused on how children and families can be better served in the Hispanic community, how the faith community can be involved in strengthening vulnerable families, ways to address racial disparities in the foster youth population, and how community leaders can support families and foster youth and help child welfare agencies. The event, “Wake County Making It Happen: Strengthening Families and Building Communities of Hope,” offered attendees simultaneous translation of the day’s speeches in Spanish. In fact, one of the breakout sessions was conducted entirely in Spanish for the more than 30 people who attended. According to the U.S. Census, the Hispanic population has increased dramatically in Wake County since 2000, and child welfare agencies are working hard to build bridges to the community. A film crew commissioned by Casey captured the event for a future video presentation on how Wake County is building a Community of Hope. And one of the things the Masai have come to understand – I always take my watch off because I know at some point somebody’s going to get tired of listening to me – the Masai, whether they have children, whether they expect to have children, or never have children, understand that the care of its children is the responsibility of everyone in the village. And so I greet you this afternoon because I know that here in Wake County, you have begun a process that says you value your children and you, like the Masai, understand that the concern for our children has to be everybody’s concern. That you understand that caring for your children has to be my obligation and caring for my children has to be your obligation and if we don’t live that, then we will never be the nation that we called ourselves to be. We will never be as great as we sometimes suggest that we are. You see, all of our children must be raised to live with a sense of hope. And living with a sense of hope means that you live with this deep, abiding expectation that the thing you desire, that future that you leave, is going to be yours. You live with this expectation, that that is going to be real someday. Every day in America, on average, these children who live without this vision experience a life where over 2,000 children are confirmed as victims of child abuse and neglect, on average, every 24 hours in this country. On average, every 24 hours in this country, 700 children are removed from their families and placed into foster care, supposedly on a temporary basis. But far too many of them leave that system when they become adults — with no place to go. Every day on average every 24 hours in this country, four babies die from child abuse and neglect, most of them before they reach their fifth birthday. Every day in this country, land of the free, home of the brave, one of the richest and most powerful nations in the world, seven million of our children wake up living in homes where they live off approximately eight dollars a day per family member. Our U.S. government calls that “extreme poverty,” but extreme poverty is just another label that traps us into believing that we can distinguish in that manner. Because if eight dollars is extreme poverty, then what is ten dollars? I don’t know that ten dollars a day per family member will take you very much farther than eight dollars a day. But every day, without a vision, approximately 13 young people under the age of 25 lose their life to homicide and more tragically, approximately 12 young people in this great nation, every day, living without hope, take their own lives. For them, death holds a better proposition than living one more day of life as they know it. That’s America. Twenty-nine young people under the age of 25 lost every single day. And I was giving this speech in D.C. the other day and it struck me that those 29 lives, every 15 days, total 435. Every 15 days we lose enough young people to fill the House of Representatives in this nation. The challenge is: What are we going to do about it? Because looking at this picture, I’m sure that there’s nobody in this room that’s looking at me saying, “That’s an acceptable reality for me.” If that is not a reality for us that’s acceptable, then what are we going to do about it? What are we going to do to change that picture in the living of children, because living without hope changes you? I, I don’t know if any of you have spent any time wondering if tomorrow was going to happen for you? But when you live a prolonged life where you don’t have hope that tomorrow exists for you – someone once wrote that, “If you remove hope from the heart of a man, you make him a beast of prey,” – and I wonder if that translates into the violent behavior that we see from so many young people. I wonder if that translates in the lack of energy and effort that we see for so many of our young people. I wonder if the loss of hope has changed their trajectory for their own lives. What future will we create if we don’t change? I ask you, Kasserian Ingera? How are your children? Seven years ago, at Casey Family Programs, what was started by the late Jim Casey, the founder of UPS, we asked ourselves a question in 2006: What would happen in America if nothing changed in the way that we were treating children in child welfare over the 15 years from that point in time to the year 2020? And the answer was unacceptable: Over nine million more of our children would experience foster care in this country if we didn’t change anything. That over 300 thousand of our young people would age out of foster care in this country with an expectation that only about three percent of them would get a college degree from a four-year college if we didn’t change something in this country. And so because of that question, we set out on a path to have a conversation with America. And that conversation is one that says, “What are you willing to change?” What do you know about your children? What do you know about their futures? What do you know about the fact that it’s not all children in Wake County that we’re talking about? It’s not even all children in Raleigh that we’re talking about. There are certain ZIP codes that I’m sure you know better than I do that if you want to change the trajectory of Wake County’s future, we need to visit those ZIP codes. We need to stop by and begin to have a long-term exchange with the people who live in those ZIP codes to say, “You can participate in changing your future. It is not government’s responsibility to make you whole.” We must do this together. But as a sign of good faith we will begin to behave differently as government, we will begin to behave differently as philanthropy, we will begin to behave differently as educators. That’s what making it happen and building communities of hope seeks to push for us in this country. It seeks to push this notion that we cannot overlook the fact that where you live is one of the biggest determinants about where you will end up in this country. It’s a fact. In Seattle, where I come from, there’s a ZIP code, 98108, that is separated from another ZIP code, 98040, and they are separated simply by one mile of water. On one side of that mile of water is South Seattle. The other side of that mile of water is Mercer Island, and some of our most renowned CEO’s and executives — I’m not counted in that number, [laughter in room] — but some of our most renowned CEO’s and executives in the State of Washington live on Mercer Island. And one of the sad realities, that still hurts me today, every time I see it, is that a baby born in 98108 has a ten-year shorter life expectancy than a baby born the same day in 98040. Something needs to change, and I don’t think it’s something that’s in the water in 98108, although the EPA suggests that it might be. [laughter] Because 98108 is the most polluted ZIP code in the entire King County area and we have known this for years. And therefore the health disparities in 98108 greatly outweigh those in 98040. And I use those ZIP code numbers because they matter. They matter because when you do the hot spot here in Wake County, you might register – let me see if I can remember what it was – is it 276, somebody know what I’m talking about? 27610. That number might come up when you do the hot spot. You see when you start to look at who has a college degree in, who’s in the 44 percent and who’s in the 48 percent? I’m not Mitt Romney now, I’m not saying that, but when you start to look at that, the ZIP code might tell you something. But, you know, I was challenged so I looked a little bit farther than 610 and I looked at 601 – not too far apart – one central, one east. And I looked at 601 and I said, “Well, wait a minute, the greater percentage of residents in 610 and 601, they are both African American, there’s a smaller percentage of white people living in both, there is a smaller percentage of Latino, what’s the difference? I looked at the schools: 601, performing above average on test scores; 601, nobody getting free and reduced lunch. 610, below average on test scores; 610, close to 60 percent free and reduced lunch. The picture tells something, and I’m not telling you that I just walked up into Wake County today and I know what the picture is saying. I’m saying that the work that you have in front of you today is to ask yourself, “What does the picture say?” And when we conclude what the picture says, what are we willing to do about it. What are we willing to invest in doing something about it? Who do we need to engage in this conversation about doing something about it? And how do we spread this conversation beyond Wake County to the rest of North Carolina and to the rest of this nation and take it to D.C.? Because, you know, the citizenship of Wake County suggests the citizenship of America. And we need to have a conversation with those who are in charge of making decisions in America, because as long as it is okay for the federal government to spend six dollars on foster care for every one dollar that it spends on community building and community support services, we’re going to have the picture that that money buys. That old – this thing that you get what you pay for. If you’re financing structure says buy foster care, then guess what you’re going to have: foster care. The states didn’t have to match (the funds), and so the direction of federal dollars determines the direction of state dollars. And what we’re saying is, that’s enough. It’s time. It’s time for us to decide that every child in America deserves a community of hope. It’s time for us to decide that every child in America deserves to be raised in a community, where if their parents have mental health issues, they have some place to turn. If their parents have substance abuse issues, they have some place to turn. If their parents are struggling with how to even change a diaper, you – how many of you as new parents knew exactly – you read the manual. You knew that we learn. And the question that we need to ask ourselves is how will they learn without a teacher? And if you are socially isolated, who is teaching you? Human capital is a very important conversation, but we must make some other economic positions. Most people that you meet would love to be able to take care of themselves and their family, but if you can’t find a job, is that your fault? If you find a job and it doesn’t have benefits and therefore you’re working but you can’t, still can’t fully take care of your family, is it your fault? If you find a job and it doesn’t pay you enough money to live on – there are more people who are working and still having to rely on federal and public assistance than there are who are not working and getting it. We must make some economic decisions in this country, to create an opportunity for everybody to be in a position to instill hope. Because even my three-year old, who cries when I leave, who was crying this morning when I called on the phone [sniffling sound] – no, just kidding, [audience laughs] that’s what my wife was doing [laughs] – is able to comprehend, “I don’t like it when my daddy is gone, but I understand that him being gone is a part of his job.” And she said to her mother, “Mommy, I get hurts but I’m not upset because I like to eat.” My three-year old gets the concept that if you work you should be able to take care of your family. We need to get that concept down here in America. And we need to make some decisions going forward about how do we move this conversation away from being a conversation about what government and philanthropy and others can do for and to a community, and move it to a place of, what can we do together with communities? How can we work with communities to empower them to be the leaders and the determiners of their future? How can we work with communities to help them teach their children and their children’s children that tomorrow may not be promised to you but if you work hard enough and you get your education, you can be in the conversation, and that’s in your hands? Because we can’t – I told somebody once, “I can explain it to you but I can’t understand it for you” – and we’ve got to get our children to a place where they understand that they have to understand it and internalize this education for themselves. But we can do that. You know why we can do it? Because we did it for the 47 percent and if we can do it for them then we can do it for the 44 percent that haven’t quite gotten there yet. But if we don’t change something now, ten and twenty years from now we’re going to be in a tougher place. And I realize that my time is vastly approaching and I didn’t even go to slide one yet. [Audience laughs] And so I’ll just go to the most important thing up here and that’s that. That’s a picture of how we came to think about child welfare intervention and other government associated interventions. That green box are the vulnerable members of our community where people are struggling. And the blue box surrounding that is where your faith community lives, where your neighbors live, where your local not-for-profits live, where the food banks are, where the grocery stores used to be. And then I say that with knowledge and intention, because grocery stores leaving blighted communities is one of the most significant challenges to the health of people in those communities, because nutrition and lack thereof has been linked to both aggressive behavior and poor performance in school. And if you have to fill your stomach with stuff that does not give you the nutrition that you need, you may be full but you’re not healthy and we can do something about that. The maroon box is where government sits and in most jurisdictions, you guys may be different, but in most jurisdictions the way we work in child welfare, something from the blue box, or maybe even the green box calls child welfare to say somebody did something to the kid in the green box. We leave the maroon box, go to the green box, have a conversation with the family, retreat back to the maroon box. If we decide that something is wrong or something that needs to happen, then we might call up a not-for-profit in the blue box and say, “Can you work with us in this foster care situation?” And then a not-for-profit might call a neighbor in that blue box and say, “Can you be a foster parent this this situation?” But then we retreat back to the maroon box having not engaged in what happened really in the community that allowed the folks in the green box to be so isolated and hurt their children without the necessary support. We’ve got to change the conversation, and the conversation is about how do all of these boxes work together, including the green box, to understand where we’re going? The commissioner, your words were so profound. The person with the problem knows more about the problem than any expert will ever learn, no matter how many years you spend on the job. It’s time for us with my one minute remaining – I didn’t even know that sign was over there – [laughs] it’s time for us to decide what we’re going to do. What are we going to do about this thing called hope? Because where there’s hope there’s life and life is the ability to keep growing. Where there’s hope there’s faith, and faith is the capacity to keep believing in spite of what you see and where there’s hope there’s light and light is the capacity to see in the midst of darkness. Someone once said that hope begins in the dark. When you cannot see the success that everything inside you tells you is possible, but because of hope you just keep moving forward, trying to do the right thing. You keep moving forward, believing that if you don’t stop the light of day will come. You keep moving forward. You keep working. You keep watching. You keep waiting. Because hope won’t let you give up. Every child in America deserves a community of hope and I greeted you with a question, Kasserian Ingera, how are the children? The Masai response to that question is: Sapati Ingera, and Sapati Ingera is a hopeful declaration that one day, if we don’t quit, all the children will be well. "It's time for us to decide that every child in America deserves a community of hope"